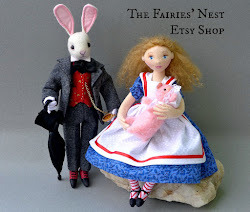 So now that I've caught your attention with that snappy title, I'll have to admit that this post is about how to turn tiny fingers for cloth dolls and not something more salacious. I've had quite a few folks ask how to make such small fingers and as with many projects the trick is to have the right tools. Here are mine..
You need to make a template for your hand pattern. 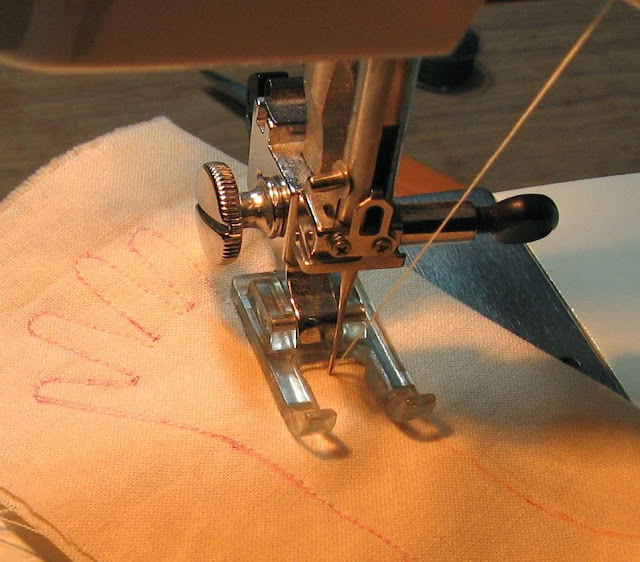 You'll want to trace the hand onto your fabric and then sew carefully right on the line you've drawn with a very tiny stitch. Make sure you have at least one stitch between your fingers so that when you cut them later you can clip a curve. Woven fabric is much harder to turn then knit but it makes smaller hands because it doesn't stretch so much when stuffed. 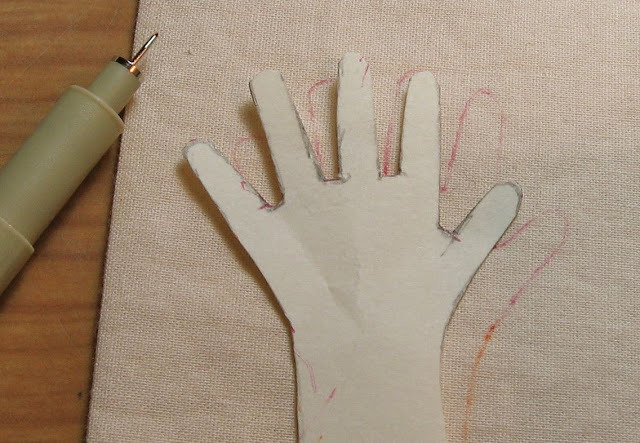 Now you will cut out the hand but don't worry about cutting close to the fingers yet. Apply Fray Check on the seams of all your fingers. You can then let it dry naturally or hurry things along and use a hot iron. Now it's time to turn the hand. 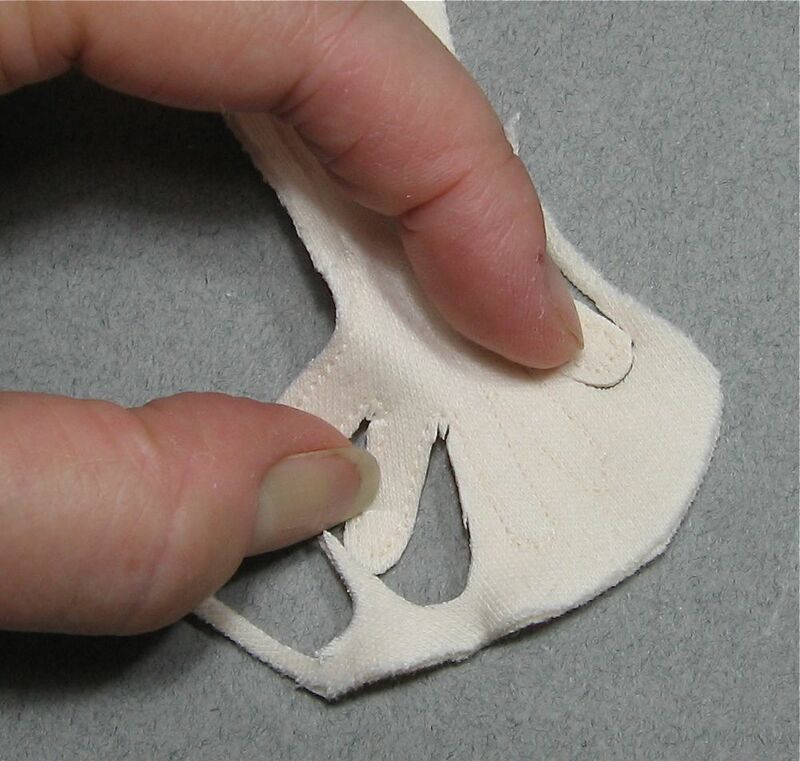 Place a larger turning tube inside the finger...the largest that will fit. Then place a smaller tube at the top of the finger and carefully slide the fabric UP the smaller tube...this is the tricky part so give yourself a few times practicing to get the hang of it. 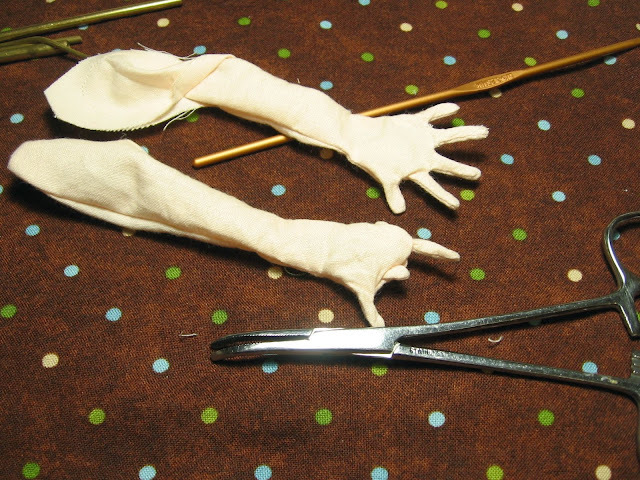 Once you have the fingers turned take the hemostats and grab the inside of the wrist and turn the hand right side out. I then use the wrong end of a small crochet hook to push the fingers the rest of the way through. So now you have hands with fingers, ready to be stuffed however you'd like! I usually use pipecleaners for the fingers so they can be posed. I hope this is clear, if you have questions don't hesitate to ask! 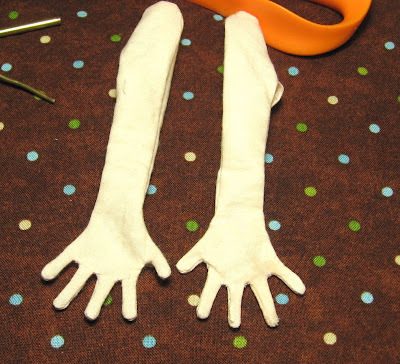 Thanks so much for the tutorial on making tiny doll hands. 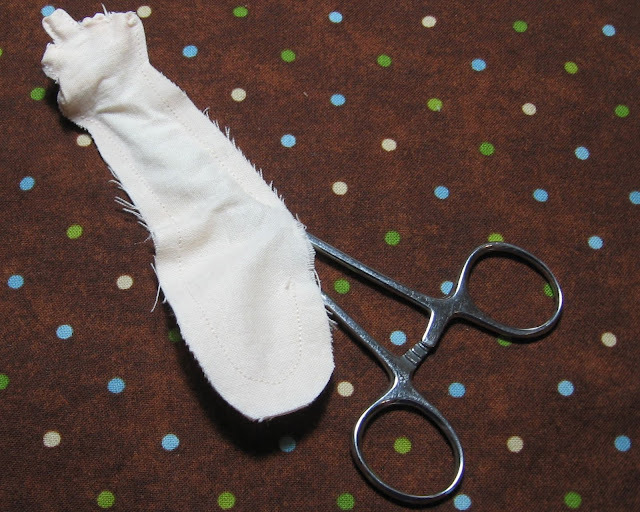 I'm new to cloth doll making so this really helps. The FRAY stop! Ah ha! 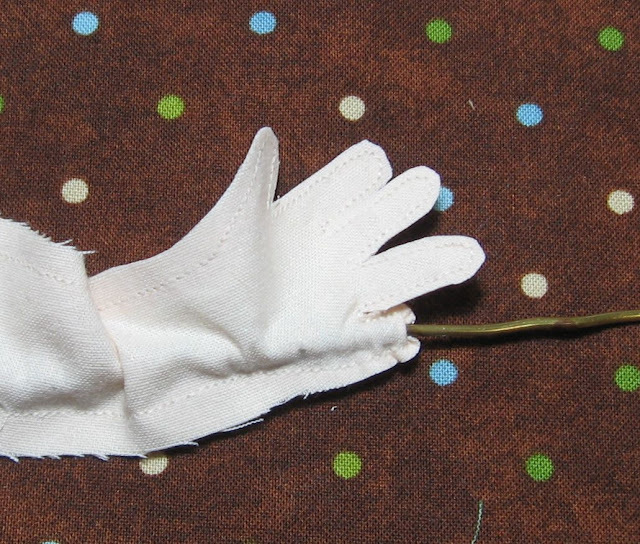 I have always swen a double seam around the fingers, but it makes it bulky. Why didn't I ever figure this out on my own? The nested turning tubes are remarkably clever. I've always done stuff like that with a single knitting needle and my fingers. how clever! I never would have thought it would be this easy. thank you for this wonderful tutorial. Great ! 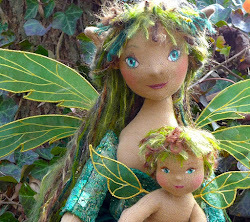 Now I am going to have to try this .....even though I have never had the desire to make a doll. Your tutorial is perfect.Thanks for sharing details.Where can I buy Fray check ? Thanks everyone! Fray check is available at most fabric stores here in the USA and you can buy it online from lots of places including Amazon.com. I've used knitting needles to turn the bigger tubes too...whatever works! That's a great and clear tutorial. It does make me think that I'd rather just buy dolls with little hands ;). Today your blog has prevented a suicide - either that or a dollicide instead hahaha. 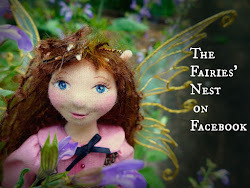 I can't thank you enough for this I was tearing my hair out doing this doll for my daughter- in-law. I have solved every other hurdle that the dolls have thrown up but the tiny little fingers had me bested, I will now go and run up my feels like 200th set and see. спасибо огромное.Всегда были проблемы с пальчиками. МК!!! Thank you so much for sharing this amazing tutorial. It's just what I was looking for!!! could you explain how the pipes cleaners are put into the fingers? Hi Elizabeth! 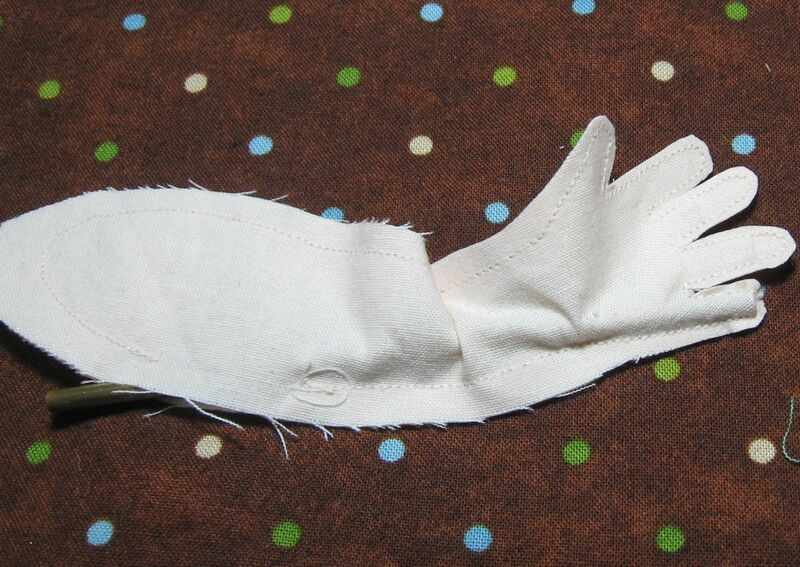 It is a bit tricky, but you just put them in through the same hole in the side that you use to stuff the doll.